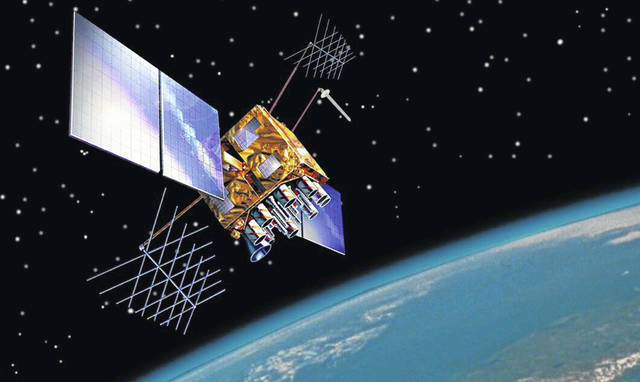 An artist’s rendition shows the GPS-IIRM satellite in orbit. The satellite helps global positioning systems run, but it requires a reset every 1,024 weeks. Since the GPS system went into use in 1980, the first reset of the week counters happened on Aug. 21, 1999, so the next one is set to take place on Saturday. Officials at the Department of Homeland Security’s Cybersecurity and Infrastructure Security Agency have warned critical infrastructure operators in communications, transportation, power grid, finance and other fields to ensure that their GPS receivers can handle the resetting of the counters this week. UTC is the gold standard of time and has replaced the pre-digital era’s Greenwich Mean Time, which was based in England. UTC is used to synchronize clocks across 24 time zones around the globe. Devices that provide UTC do so by converting GPS time using several parameters, including the week counters inside the satellites, the DHS notice said. Increasingly, time is a determinant in computer system administrators having access to networks, Caddy said. “If things are reset to zero, you may not have access to some systems,” she said.